With the travelling I've been doing in the past two weeks, I've been so out of touch with the real world (ie. the Internet) that I didn't even know it was Haute Couture week until I logged into style.com! I've only looked through three collections but they have already surprised me as they were certainly different from what I've come to expect from those desginers. Karl Lagerfeld usually sends out pretty, mostly black & white and commercial dresses so I was surprised when many of the dresses had such structured and artistic silhouettes! I have mixed reactions with the dresses though, and some of the dresses looked like a continuation of the silver Chanel dress that Anna Wintour wore to the Superheroes party. The show started with dresses that were very sophisticated, very Chanel. And ended with very romantic and elegant evening dresses. In between, there were the more structured dresses. I especially liked these two. The dress on the left reminds me of a flower (with a model in the middle.) And even though I have no idea what the frame around her model's head (on the right) does, it just looks really cool -sort of makes the model look like a haute couture robot. Although I wouldn't call these dresses ugly, I'm just not too fond of them. The one on the right especially does not look flattering. To be fair, all these dresses must look so much more impressive in real life. Before looking at the collection, I was expecting lots of rock chic, black and white again, but this collection was definitely more colourful than the previous ones. The clothes also seemed less structured. These looks remind me of high fashion soldiers marching to somewhere cold. And these make me think of glamorous Parisian parties. I like this neutral palette of colours so much more than that khaki green. Lacroix's collection is always one of the most fun to look at because it always takes you into a colourful, overly luxurious world of chiffon and laces -and this collection did just that. Just wow! I love the high fashion gothic look, and this was all done with mini skirts or dresses, making the looks very youthful and put together. The girly looks -although noticeably not as sweet-looking than his previous collections. This ones feels much darker. Notice all the ornaments and laces and details each look has! How did everyone like these three collections? One of my Favorites was Christian Dior which u did not put up here! The shoes were amazing! Check out my fashion blog to see them. I agree: Lacroix is the best of these--feminine and something interesting to look at rather than an abstract impression. I like the brown look with the bow! How often do we see brown? And so nicely done. The embroidery details are scrumptious on the white backgrounds! And the black tights anchor the looks without distracting. I also like the blue tights matched to the blue dress. Fashion is looking up. I can't stress enough how much I love the femininity expressed in ruffles, lace, bows, colors, and shapes. i loved the chanel collection. my four faves are on my page. Wow, Parisian couture, my life has regained meaning! Just kidding. Anyway, that inverse triangular dress from chanel made me think instantly of that dior couture collection a few seasons ago that was japanese inspired...I feel pretty neutral about the chanel collection. However, that white Givenchy number! My gosh! And I've never been a major fan of Lacroix, since his pret-a-porte never struck me. 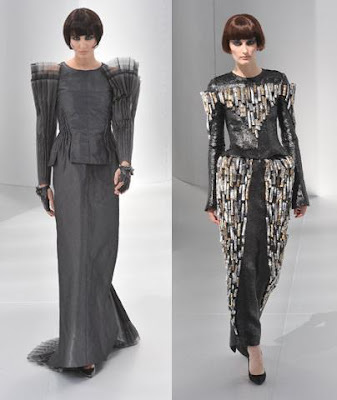 But this couture collection blew me away! The first gothic dress, the indigo, rose, and violet dress are just fantastic. Among all the Couture collections... I loved Dior. But among these 3... Id choose Lacroix. Simply original and one of a kind. It's intriguing and keeps u at the edge of ur seat... like watching a thriller! lovely recap, I loved lacroix and those crazy strange givenchy boots. How can you not mention the awful giant boots at givenchy? and they are much easier to afford. did anyone notice how eerily similar the chanel models look to katie holmes?! well i have to say the Christian Lacroix collection was my favorite collection by far. Everything was put together perfectly. All of the pieces looked great together. My dress would have to be the pink one. But i loved everything. The House of Chanel, more commonly known as Chanel, is a Parisian fashion house in France that was founded by Gabrielle Bonheur "Coco" Chanel. According to my sources new year 2019 wishes and sayings can be very special if used wisely to the persons you love.